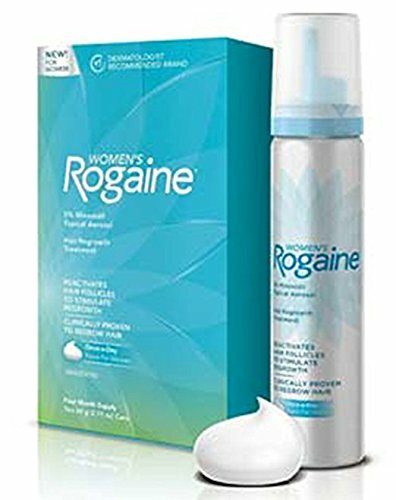 Regrow thicker, fuller, beautiful hair with Women's ROGAINE Hair Regrowth Treatment, Once-a-Day Foam. Containing 5% minoxidil, this foam reactivates hair follicles to regrow hair. The only once-daily hair regrowth treatment for women approved by the FDA, this formula is clinically proven to regrow hair in 81 percent of women. New hair comes in up to 48 percent thicker than before, with clinical results in as little as 12 weeks and visible results with continuous daily use after 24 weeks. From the number-one dermatologist recommended brand, the once-a-day applied foam can fit into your regular beauty routine. This package of Women's ROGAINE Foam includes two 60-gram cans, an four-month supply.